Following on from the successful Kids Praise Party DVD this fantastic new animated DVD which contains another 10 new cartoon songs. This is an incredible high energy resource for church, school or home, designed to bring kids teh great news of Jesus in a relevant, fun-flavoured way. Features: 10 animated songs, swing-along karaoke, subtitles, sign language and backing tracks. Kids Praise Party 2 DVD by Spring Harvest was published by Elevation in April 2014 and is our 14797th best seller. The ISBN for Kids Praise Party 2 DVD is ELE1932A. Be the first to review Kids Praise Party 2 DVD! Got a question? No problem! 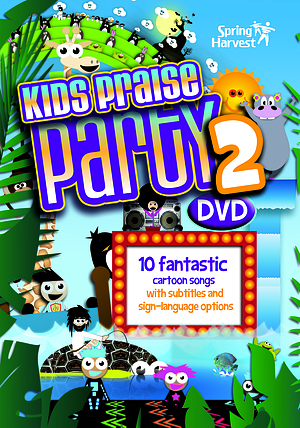 Just click here to ask us about Kids Praise Party 2 DVD.